Vinyl windows come in all kinds of shapes, colors, and sizes, making them perfect for any home. If your home has old windows with peeling, rotting frames, or if you've noticed drafts coming in around your windows, it may be time for a change. 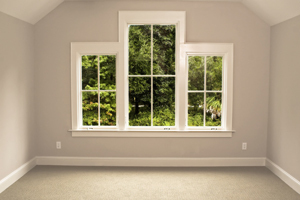 Replacement windows can markedly improve home comfort, energy efficiency, and curb appeal. Matched with updated siding or a new roof, replacement windows can help make a dramatic statement to guests and passersby. C. Jenkins Construction specializes in a wide range of replacement window styles and options. Using the industry's best windows created by experienced manufacturers, we'll be sure to have the perfect window for your living room, kitchen, or any other space in your home. Our fully trained and certified window specialists are more than ready to help you transform your home. To see if your windows could use a makeover, schedule an estimate with C. Jenkins Construction today! Replacement windows offer a number of great benefits to any home. New windows are a great way to improve curb appeal and property value, both by themselves and as part of a larger remodel. Many homeowners also choose to install new windows for energy efficiency improvements. Modern windows will eliminate drafts and come with energy efficient glass that will help you save money on heating and cooling costs. Additional benefits of replacing old windows include less maintenance and added security. New windows - especially ones made out of materials like vinyl or a composite - are extremely easy to clean, and won't need to be painted. Fitted windows also decrease the probability of a break in and help block outside noise, allowing you peace of mind. Here at C. Jenkins Construction, we specialize in vinyl windows guaranteed to suit your taste and budget. Vinyl windows are highly popular and are known for their affordability and durability. They come in a wide variety of colors and styles, so you can find something to match both the inside and outside of your home. Because they are made from polyvinyl chloride (PVC), vinyl windows are also extremely low maintenance - you won't need to paint or stain them, and they also will never rust or corrode. Any replacement window that's properly installed will likely contribute to improved energy efficiency, as a newer, tightly fitted frame will reduce drafts. However, replacement windows also come with a variety of additional efficiency features for optimum performance. Low-e, or low emissivity, glass is a popular window component because it can help make your home more temperate. This reflective coating can direct warm air away from your home's interior in the summer, as well as force warm air to stay inside during the winter. Other options include argon-filled glass and insulated frames. No matter what kind of replacement window you decide upon, be sure to check its ENERGY STAR efficiency rating to be sure you're getting the most for your money! Whether your primary motivation is anything from decreasing energy bills to fixing up your home before you sell, replacement windows from the experts at C. Jenkins Construction are sure to fulfill your needs and exceed your expectations. Countless customers have relied on us for attractive, effective windows that suit their tastes and budget requirements, and we know we can provide you with the same exceptional service we're known for. Ready to get started on your replacement window project? Contact us today to schedule a consultation and estimate!